Bobo Carpenter squeezed a wraparound goal past UConn goalie Adam Huska to give the Terriers a 5-4 overtime win against the UConn Huskies in Game 1 of the Hockey East Quarterfinals. It was the junior assistant captain's team leading 19th goal of the season, as well as his 7th goal in four games against UConn. After the game, Carpenter said that the team's "...focus the past two weeks has been getting pucks to the net". Friday evening's game started off with the Terriers getting into trouble in their own end. Huskie junior Max Kalter got control of a rebound from a Brian Rigali wrist shot that Jake Oettinger initially stopped and snapped it past the Terrier netminder for a 1-0 UConn lead. It took BU only 18 seconds to even the score. Freshman defender Kasper Kotkansalo got the play going with a cross-ice pass out of the d-zone to senior Drew Melanson. The graduate transfer student then sent US Olympian Jordan Greenway in alone who beat Huska 5-hole to tie the score at one apiece. Less than three minutes later Melanson scored his own goal. After Terrier defenseman Chad Krys shot a puck on net, a scrum ensued and the graduate transfer student skated in from the left face-off circle, gathered the puck and flipped it past Huska for a 2-1 BU lead. That lead would last thru the rest of the first period and proved to be the only lead the Terriers would play with during regulation. The second period belonged to the Huskies. A goal by UConn junior Karl El-Mir at 1:31 tied the game. Then, at 14:31, fellow classmate and former BU recruit Max Letunov gave the Huskies a 3-2 lead to close out the scoring in the middle frame. The Terriers took advantage of a power play two minutes into the third period. Junior Dante Fabbro sent a wrister from the high slot that Greenway redirected past Huska to even the score at three apiece. BU killed off a UConn power play in the middle of the third frame. However, less than a minute after that kill, Shane Bowers took a hooking penalty that proved to be costly. Halfway through that Huskie power play, sophomore Benjamin Freeman fired a wrist shot from the slot that beat Oettinger for a 4-3 UConn lead with five minutes to go. Perhaps the most outstanding goal of the contest came less than two minutes later, when Chad Krys picked up a loose puck in the neutral zone, skated around several UConn defenders and backhanded a shot that Huska stopped. The Ridgefield, CT native intercepted a Huskie clearing attempt and wired the puck home to elicit one of BU radio announcer Bernie Corbett's most passionate "Wrister and a GOAL!" calls in recent memory. Freshman Shane Bowers added the first of his two critical helpers and the game would go to overtime. Although BU was outshot in each of the three periods, the Terriers would dominate play in the extra session. 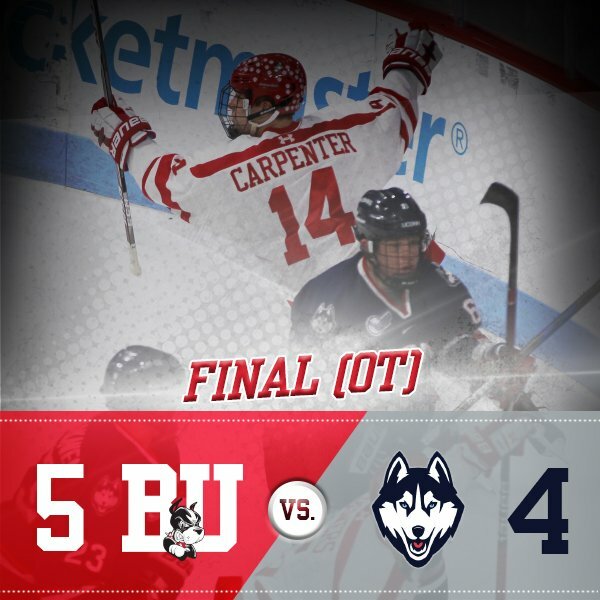 At the 5:02 mark, after freshman Logan Cockerill protected and controlled the puck along the boards behind the UConn extended goal line, Bobo skated around the Huskie net a jammed home the game winner. After the game, Coach David Quinn told reporters that he was not happy with his team's sluggish start but felt the Terriers got progressively better as the game progressed. He especially liked the fact that his team responded every time UConn scored. Terriers will go for the series sweep this evening with puck drop scheduled for 7:00. Live streaming is available with pay-per-view via the Pack Network. Former Terrier Charlie Coyle scored an empty-netter (9th goal of the season) and added an assist earlier in the game, as the Minnesota Wild defeated the Vancouver Canucks, 5-2.